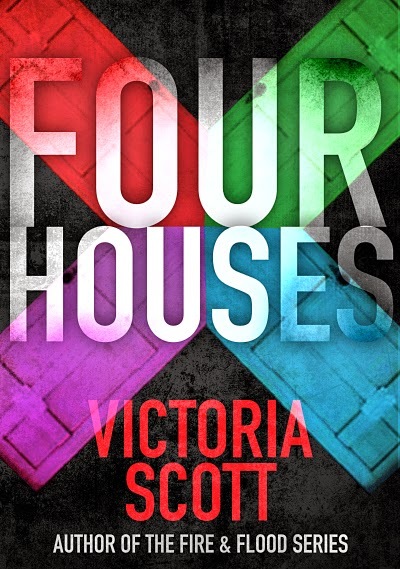 Four Houses is a dark short story told in an unusual format that leaves readers wondering how they'd react if found in the same situation as seventeen year old Maddy. Originally released over three years ago, the fabulous Victoria Scott is releasing an extended version of this horror short story, with an extra sixteen pages. This one packs a punch. To celebrate the new cover, Victoria is hosting a giveaway. She's giving away a digital copy of Four Houses and a print advanced reading copy of The Jewel by Amy Ewing. Great giveaway, I would love to read the book! I've been dying to read Four Houses for a long time...you know, I can't buy (digital) books on Amazon because I don't have a credit card. So thanks for the givvy! BTW, I don't comment often, but I faithfully read :). Interesting cover... The title sounds like Harry Potter in a way though. I haven't read her other series yet!